Points Too! THIS IS NOT the low-grade chevron agate You’ll find Elsewhere! 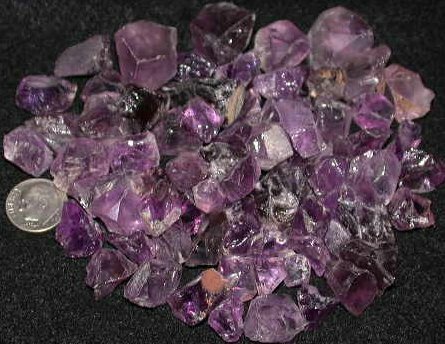 Each order is for 1,000 FULL CARATS (Random 1,000 carat sample pictured above) of QUALITY Genuine Amethyst Rough For Only $16.95 Just over 1 cent per carat !!! Get rough amethyst stones that sell elsewhere individually for more than the price of your entire 1,000 carat lot. Each lot will be scooped at random and weighed to be at least 1,000 full carats. 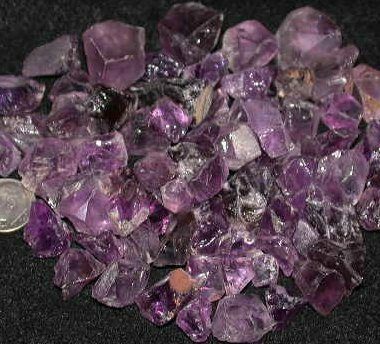 The amethyst ranges from translucent to transparent to clean and varies in color from light violet to rich deep purple.